An early indication of autism can be identified in babies under six months old, a study suggests. US researchers, writing in Nature, analysed how infants looked at faces from birth to the age of three. They found children later diagnosed with autism initially developed normally but showed diminished eye contact - a hallmark of autism - between two and six months of age. A UK expert said the findings raise hope for early interventions. 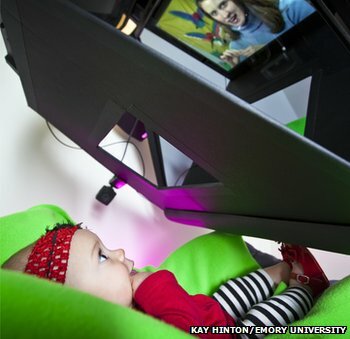 In the study, researchers led by Emory University School of Medicine in Atlanta used eye-tracking technology to measure the way babies looked at and responded to social clues. They found infants later diagnosed with autism had shown a steady decline in attention to the eyes of other people from the age of two months onwards, when watching videos of natural human interactions. Lead researcher Dr Warren Jones told BBC News: "It tells us for the first time that it's possible to detect some signs of autism in the first months of life. "These are the earliest signs of autism that we've ever observed." The study, in collaboration with the Marcus Autism Center and Children's Healthcare of Atlanta, followed 59 infants who had a high risk of autism because they had siblings with the life-long condition, and 51 infants at low risk. Dr Jones and colleague Dr Ami Klin followed them to the age of three, when the children were formally assessed for autism. Thirteen of the children were diagnosed with autism spectrum disorders - a range of disorders that includes autism and Asperger's syndrome - 11 boys and two girls. The researchers then went back to look at the eye-tracking data, and what they found was surprising. But he added this could be seen only with sophisticated technology and would not be visible to parents. "It's not something that parents would be able to see by themselves at all. If parents have concerns they should talk to their paediatrician." Dr Deborah Riby, of the department of psychology at Durham University, said the study provided an insight into the timing of atypical social attention in children who might go on to develop autism. "These early markers are extremely important for us to identify - the earlier we can diagnose a child who has one of these disorders - such as autism - the earlier we can provide intervention and development," she said. Caroline Hattersley, head of information, advice and advocacy at the National Autistic Society, said the research was "based on a very small sample and needs to be replicated on a far larger scale before any concrete conclusions can be drawn". "Autism is a very complex condition," she said. "No two people with autism are the same, and so a holistic approach to diagnosis is required that takes into account all aspects of an individual's behaviour. A more comprehensive approach allows all of a person's support needs to be identified. "It's vital that everyone with autism can access a diagnosis, as it can be key to unlocking the right support which can enable people with the condition to reach their full potential."